Real-time information is integral to deliver repeatable and accurate results when working with fluids. Measure and regulate the thermal condition of your process with temperature monitors, sensors and switches. The right process measurement device can maximize efficiency while curbing production downtime. Whether you need to gauge operating temperature, actuate one or more operations or trigger an alarm when conditions are outside of your desired operating range, you can obtain precise, repeatable and accurate results with assistance from Meacon Corporation. 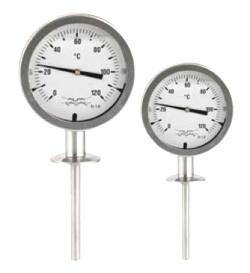 Meacon distributes a variety of measurement and control devices from the world’s premier fluid handling product manufacturers for high purity, sanitary and industrial applications. The temperature monitors, sensors and switches we carry produce consistent performance, meet international industry standards and help keep production at your facility running smoothly. Our experienced team can recommend customized solutions for your fluid handling challenges. In addition, we offer online technical support, on-site inventory management, custom assembly and technical training seminars. Find the right temperature monitor, sensor or switch for your process with assistance from the experts Meacon, a leading supplier of high purity and industrial flow components and systems. Our employees are knowledgeable, have strong supplier relationships and meet customer needs on time, every time.